Earn $9.43 in Rewards credit (943 points) What's This? 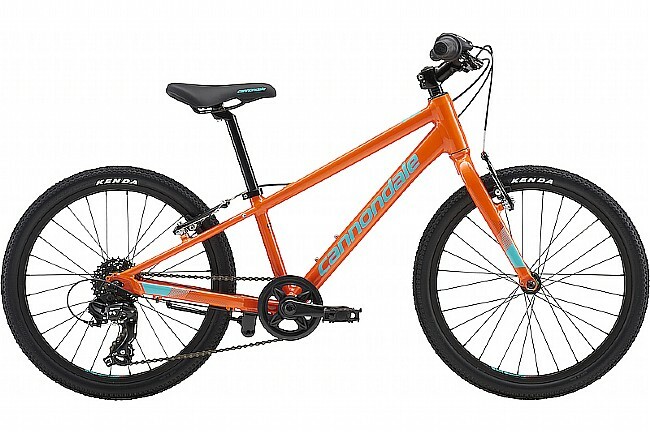 Cannondale’s 2018 Quick 20 Boy’s Bike is designed for street riding; equipped with a lightweight SmartForm C2 alloy frame and fork as well as a wide range of gears for smooth, stable handling. Frame Material: SmartForm C2 Alloy, smooth welding. Fork: Rigid, SmartForm C2 Alloy, 1" steerer. Headset: VP, Alloy, 1" Ahead, integrated. Shifters: Shimano Tourney Revo Twist Shifter, 7-speed. Rear Derailleur: Shimano, TY300, 7-speed. Crankset: Prowheel, Pro-V30, 110mm length, 30T. Cassette: Sunrace, 7-speed cassette, 11-28. Chain: KMC, Z51, 1/2" x 3/32". Brakeset: V-Brake, Alloy linear pull. Handlebar: Lightweight Alloy, 580mm wide, 25.4mm. Seatpost: Lightweight alloy, 25.4 mm. Rims: Cannondale C4, lightweight alloy, 20", 28H. Hubs: KT Alloy, 7-speed freehub. Tires: Kenda Small Block 8, 20x1.5".